Lazada has been going all out with its birthday bash. Seizing the opportunity to jump on the hype was none other than challenger Shopee. 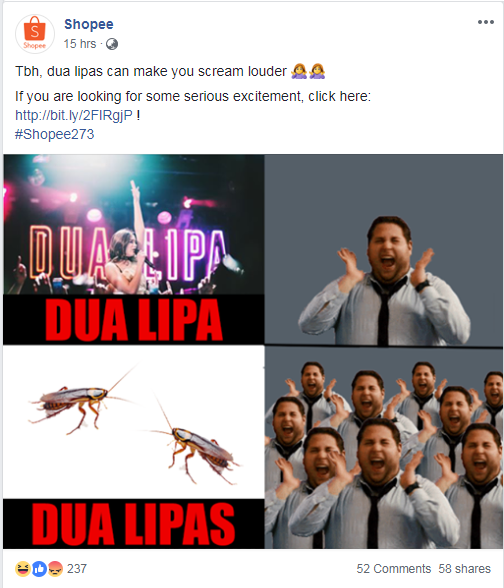 In a Facebook post, Shopee poked fun at Lazada’s headline star for the bash Dua Lipa saying that while the international celebrity “makes you scream”, dua lipas (which means two cockroaches in Malay) can “make you scream louder”. Posted with a humorous attempt at a pun, the joke however fell flat. Shopee ended up garnering the criticism of netizens who deemed the move as not “professional” and not the “right way to do marketing”. This then led to Shopee quickly apologising to users for its light-hearted pun going out-of-hand. “We hear your disappointment and that was certainly not our intent. We would like to extend our heartfelt apologies and we are determined to monitor and produce the best content to serve you better moving forward. Thank you once again for your kind understanding and support,” the post said. In a statement to A+M, a Shopee spokesperson said that in listening to the community, the team realised that what was intended as a light-hearted social media post may have missed the mark. “We have removed the post, and we apologise for any offence caused. We celebrate all those who are working to provide an enjoyable eCommerce experience for shoppers in our region,” the spokesperson added. Speaking to A+M, a Lazada spokesperson said that it is pleased to share its seventh birthday bash and Super Party with the consumers in Southeast Asia last night. Saying its the first to bring the concept of shoppertainment to this region, Lazada aims to continue to innovate on that front. “The phenomenal response we received last night from our celebrities, hosts, fans and brand partners, sellers was just overwhelmingly positive. We want to thank all our customers and everyone who tuned in to our Super Party,” the spokesperson added. This is not the first time Shopee took a jab at Lazada. Last month, during Valentine’s Day, Shopee Malaysia took a cheeky swipe at Lazada Malaysia with its Valentine’s Day which was somewhat similar to Lazada’s “Slash” the Leng Chai Lunar New Year video released earlier this year. Lazada’s “Slash” the Leng Chai campaign offered consumers the opportunity to rent a boyfriend and spend time with senior citizens at a nursing home for a reunion luncheon. Meanwhile, Lazada has not held back on its “Super Party” promotions which was held last night in Jakarta. The event was live-streamed on its app for consumers in Indonesia, Malaysia, Philippines, Singapore, Thailand and Vietnam. Through this concert experience across Southeast Asia, Lazada said in an earlier statement that it is looking to blend shopping and entertainment, ushering an era of ‘shoppertainment’. The appointment will see the agency conceptualise and produce Tokio Marine’s first ever SEA regional brand campaign. ..
KFC has kick-started a new brand campaign to encourage teens to break free from peer influence. ..
สล็อต777 สล็อตออนไลน์ฟรีเครดิต เล่นผ่านมือถือ เล่นจริงได้เงินจริง Jackpot888 Gclub Mobile Iphone Android ดาวน์โหลด Gclub มือถือ - Royal Ruby888 SPIN999 | สล็อตออนไลน์อันดับ1ในไทย แทงบอลออนไลน์ เว็บพนันออนไลน์ ฟรีเครดิต แทงบอลออนไลน์ สล็อต สล็อตออนไลน์ คาสิโนออนไลน์กว่า 100 เกม | ฝาก-ถอน 24 ชม.